WINSTON-SALEM, NC (Feb. 21, 2012) – It’s a dark and stormy night, with neon motel signs providing the only glow. Out of the shadows of dingy back alleys and tired brick storefronts, there is a woman trying to slip away. The only thing she leaves behind is the hollow sound of spiked heels clattering on the sidewalk. What has she done? Where is she running? Film noir intrigue comes alive in Tracey Snelling’s stage set installation Woman on the Run at The Southeastern Center for Contemporary Art (SECCA) beginning March 1, 2012. SECCA is located at 750 Marguerite Drive, near Wake Forest University. At 7 p.m. Friday, March 1, SECCA will host an introductory artist talk by Snelling in the McChesney Dunn Auditorium followed by an opening reception. During the presentation Snelling will discuss the motivations and manufacture behind her exhibition, as well as the larger context of her cinematically influenced practice. The event is free and open to the public. Woman on the Run will be on view until May 27, 2012. In Woman on the Run, Snelling evokes a world of black & white Hollywood crime thrillers where the lines between good and evil becomes tantalizingly blurred. Within the exhibition space Snelling creates a world unto itself, where audiences will walk through pieces of a city and an abandoned motel room. The woman is the protagonist, and the question remains what did she do and did she really do it? Snelling builds sets of all scales, from toy model to lifesize, that map the seedy, but unmasked sides of cities across America. This exhibition brings cinema to life, and invites the viewer inside to navigate a world of femme fatales, gritty theatre, and the questions of female representation in film. The viewer lives the mystery and follows a trail of clues through film, video, sculpture and environment. The exhibition was collaboratively produced by The Frist Center for the Visual Arts in Nashville, TN and SECCA. 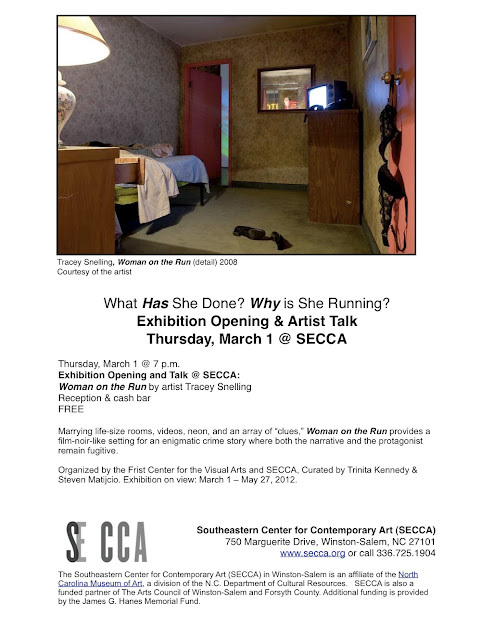 Woman on the Run recently showed at the 21C Museum in Louisville Kentucky, and will be presented at the newly re-named Virginia MoCA this Fall. For additional details, please visit www.secca.org. The Southeastern Center for Contemporary Art (SECCA) in Winston-Salem is an affiliate of the North Carolina Museum of Art, a division of the N.C. Department of Cultural Resources. SECCA is also a funded partner of The Arts Council of Winston-Salem and Forsyth County. Additional funding is provided by the James G. Hanes Memorial Fund. The N.C. Department of Cultural Resources annually serves more than 19 million people through its 27 historic sites, seven history museums, two art museums, the nation’s first state supported symphony orchestra, the State Library, the N.C. Arts Council and the State Archives. The N.C. Department of Cultural Resources serves as a champion for North Carolina’s creative industry, which employs nearly 300,000 North Carolinians and contributes more than $41 billion to the state’s economy. To learn more visit www.ncculture.com. Pleased to know about this contemporary art show. My colleague booked one of budgeted Chicago venues for her promotion party last month. She was really excited and made fabulous arrangements. Invited all her friends, relatives and office mates.